Friday night saw the 2nd Unofficial 200m World Ocean Ski Sprint Championship which was held in the Viaduct Harbour in the heart of Auckland City. A field of 26 including a few young sprint paddlers lined up in a knockout competition. After the heats and semi finals we had our 5 finalists which included last year’s champ Robbie Ford and runner up Sam Newland and Mike Walker. In the end it was a very close race as young Sam Newlands held off a fast finishing Robbie Ford to win the 2nd Unofficial 200m World Ocean Ski Sprints from Robbie Ford 2nd with Mike Walker 3rd. After the race Robbie discovered Sam’s secret to his win as he had taped over his drain and sponged out his footwell before the start. This meant Sam got the jump on the field at the start and held onto it. 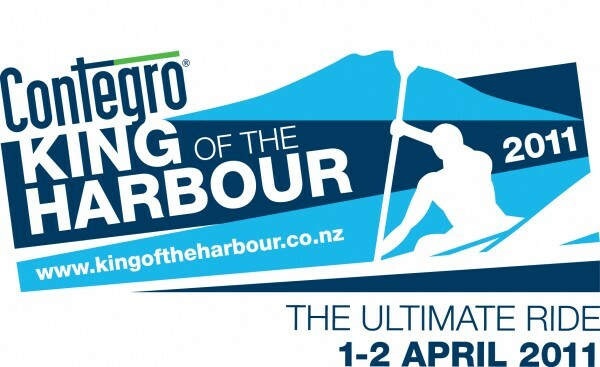 Olympic silver medallist Ben Fouhy celebrated his return to competitive kayaking with a win in New Zealand’s premier surf ski race the Contegro King of the Harbour. The morning started with all the competitors and skis being loaded onto the Fullers Quickcat for the 45min ride to Waiheke Island which lies in the heart of the Hauraki Gulf where the race was to start from. Also aboard the ferry were the families and supporters of the paddlers. 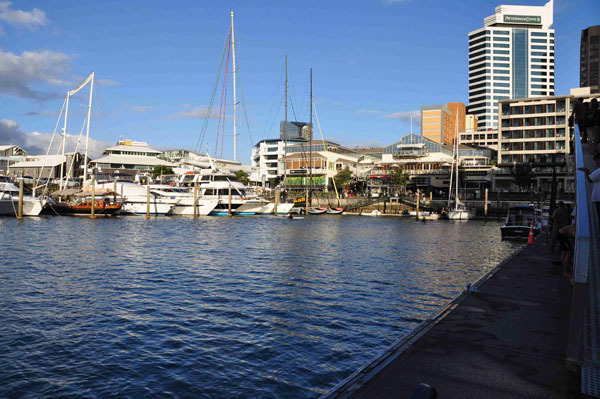 They would be able to follow the race and see for the first time how it unfolds from start to finish on the smaller Seaflyte ferry’s return to Auckland. This is a unique aspect to this race. This year we had a good number of international paddlers with a team of 7 from Tahiti led by Leopold Tepa, a starter in the very first King of the Harbour race 10 years ago. Also here was David Jensen, course director of the US Surf Ski Championship from San Francisco along with his wife Judy. Judy teamed up with a local paddler to compete as the only OC2 in the field. Direck Bezuidenout was here with his family from Florida so found a ski and was ready to race. 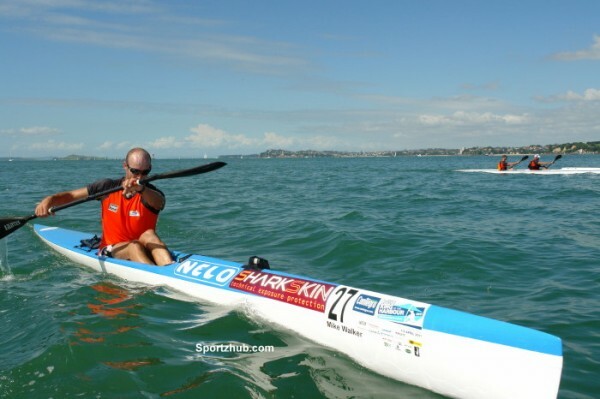 Malcolm Hall returned this year to race a double with a young paddler, Peter Boer from Sydney. The Gulf was glassy due to the NE wind of around 10 knots and clear blue skies. Seventy-four Ocean skis lined up at the start of the Contegro King of the Harbour Ocean Ski race with paddlers self seeding themselves and forming a nice straight start line. After a short delay the flag was dropped and they were off. 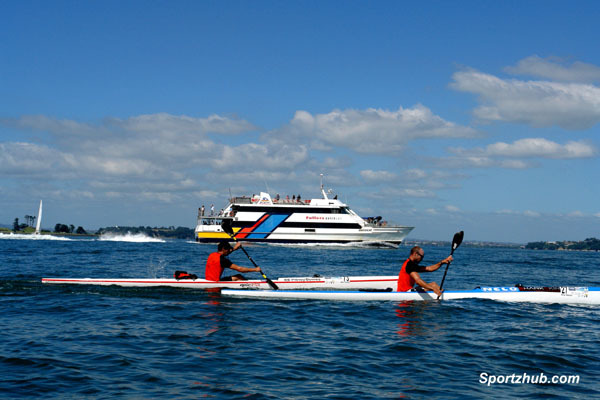 Ben Fouhy and defending champion Mike Walker and the double of Malcolm Hall and Peter Boer paddled away from the main field of paddlers only minutes after leaving Waiheke Island on route to the finish at the Viaduct Auckland City. Ben Fouhy and Walker with the double sitting to one side then headed right towards the channel while another breakaway group including Trans Taupo winner Travis Mitchell took a more inshore route closer to Browns Island staying just out of the tidal steam. Another group went very wide to the left and looked like they had made the right choice as they looked to be making up places. As the leaders passed Rangitoto Island it was Walker and Fouhy who lead by several hundred meters on Mitchell’s group who were now finding the going a little harder. The tide had turned and a large bunch headed by Tim McLaren with Paul Wilford, Tim Grammer and Simon Longdill all working at taking a lead to try and bridge the gap. Simon McLarin was a few hundred meters further back working every wave he could to make up ground. In amongst the long line up of paddlers that streamed out of Waiheke was a world class women’s field. Led by former world champion and undefeated King of the Harbour champion Katie Pocock followed by Trans Taupo winner Dene Simpson, surf lifesaving champion Bailey Elliott, and Speight’s Coast to Coast champion Sophie Hart. The first double home was Malcolm Hall and Peter Boer in 1:36.46 with Lance Roozendaal and Tina Leona 2nd 1:44.59. Once again it was Katie Pocock who won her 10th Contegro King of the Harbour title in 1:49.59, with Dene Simpson second 1:50.59, Bailey Elliott third 1:54.55 and Sophie Hart forth 1:55.35. A big thanks to the team at Neloski for getting in behind this year’s race at the last minute by sponsoring an excellent meal for 130 people which included the 78 paddlers and their families which was held at the Takapuna Boating Club. This was followed by medal presentations for both the Canoe Racing New Zealand Ocean Ski Championship and the 2011 Contegro King of the Harbour Ocean Ski race.